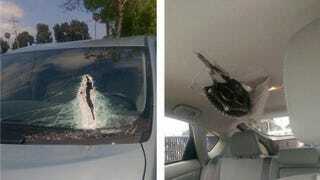 A driver in Redwood City, California, had a near-death experience yesterday when a motorcycle sprocket flew across the highway, through the windshield, and embedded itself in the roof of the car. The incident happened on highway 101. Frustratingly, no other information is available.